Wood-grained boardwalk stamps were a creative solution for a family that wanted a maintenance-free, durable walkway in their backyard. As part of a patio renovation, Kevin Baltz of Baltz and Sons Concrete in Somerville, Tenn., helped overcome some design challenges for the McCall family’s backyard. The McCall family wished to enlarge their patio space, pushing the area further into their deep back yard. They also sought to add in both an outdoor fireplace, as well as some sort of water feature. Through a recommendation from designer, Debra Lutz, the McCall’s contacted Baltz and Sons Concrete. Initially, the McCall’s were inclined to install a raised waterfall type feature, but after some consultation and input from Kevin Baltz, they embraced the idea of a larger koi pond feature, with a water-fall anchoring one end. One of the issues with the backyard design was positioning. The fireplace had to be positioned for both code requirements and line of sight advantage– but this pushed the water feature, the now larger koi pond, to a side of the yard that currently served as walkway access to the front. Baltz proposed keeping this layout but adding a footbridge that would span the koi pond, maintaining access to the front by means of a new concrete walkway. However, the McCall’s were reluctant to introduce any materials that may require extensive maintenance or regular replacement–so building with wood was ruled out. It was at this point that Baltz proposed a concrete footbridge that could mimic a wooden one. 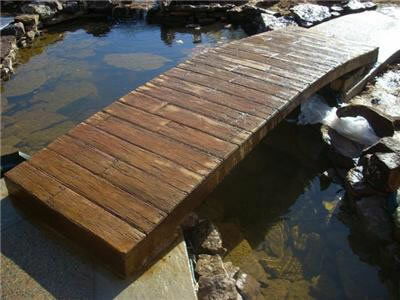 After careful design, Baltz and Sons consulted with Contractor Source, who in turn supplied the wood-grained boardwalk stamps to be used to texture the surface of the bridge. Baltz and Sons built the form off-site, then secured the form in place, tying in steel reinforcement for structural integrity. The bridge was then poured in place using high-strength ready-mix concrete reinforced with Buckeye UF-500 cellulose fiber, chosen for not only its structural benefits, but also its ability to improve rather than impede eventual staining and sealing. After adequate curing, the bridge form was then stripped, and 4″ grinders were used to add character and design, as well as touch up or remove form slurry-lines. 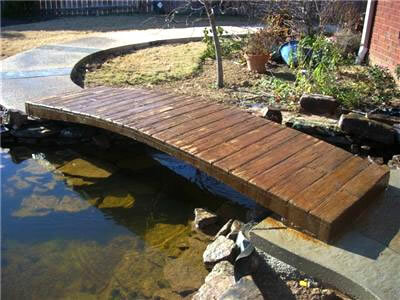 The bridge was then pigmented, using three colors of acid etch stain, as well as topical highlighting oxides. The bridge was then sealed with a high-solid acrylic sealer, infused with a non-slip additive for traction andsafety. The end result is a stunning feature in of itself, that perfectly complements and balances its surrounding natural setting and hardscape areas. The McCall’s love their unique, virtually maintenance free backyard patio area–they enjoy it as the perfect venue to entertain guests, gather with their family, friends and neighbors, or simply relax in their beautiful natural sanctuary. This project further demonstrates the immense versatility of concrete as a limitless building material, and encourages contractors to think outside of the box. Baltz and Sons Concrete Services, Inc.